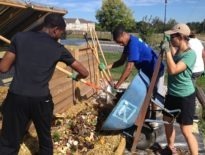 WASHINGTON, D.C. – March 27, 2019 – The movement to compost is growing rapidly as composting is increasingly valued for its ability to cut food waste, enhance local soils, and combat climate change. A new report details how small-scale composters can maximize benefits to their local communities. (Pictured: BK ROT. Source: Valery Rizzo). The report highlights examples of operations around the country: ECO City Farms in Prince George’s County, Md. ; Baltimore Compost Collective in Baltimore; East Capitol Urban Farm in Washington, D.C.; Red Hook Community Farm, BK ROT (pictured above), and Earth Matter NY in New York City; Rust Belt Riders in Cleveland; and Sunshine Community Compost in Sarasota, Fla.
Community composting operations are faster and less expensive to build out than larger facilities. They also generally do not require the same level of permitting and regulation. By supporting well-managed community-oriented composting sites that employ best management practices, individuals and local officials can take immediate action to fight climate change, reduce food waste, and improve their soils. 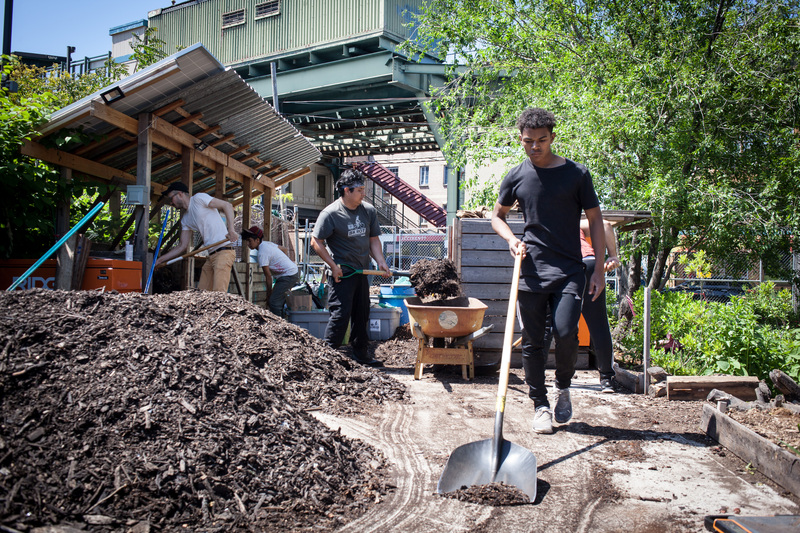 The Institute for Local Self-Reliance calls for a diverse composting infrastructure that includes backyards, schools, community gardens, and farms. Community Composting Done Right is available for free download at ilsr.org/composting-bmp-guide. Explore ILSR’s other composting resources at ilsr.org/composting. FOR MORE INFORMATION and to schedule an interview with the authors, call Hibba Meraay at 612-844-1330 or email hmeraay@ilsr.org. Print quality images of illustrations available at ilsr.org/composting-bmp-guide. Linda Bilsens Brolis is the Project Manager for ILSR’s Neighborhood Soil Rebuilders (NSR) Composter Training Program. Her work with ILSR began in December 2013 with an initial focus on state food waste recovery policies. She then led a nationwide survey of Master Composter training programs, and has managed the NSR program since it launched in 2014. The NSR train-the-trainer program is designed to be adapted and replicated as a model for community composting training around the country. 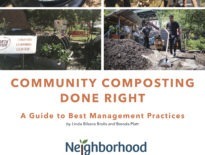 Linda was the lead author of ILSR’s Community Composting Done Right: A Guide to Best Management Practices and its 2018 Guide to Composting Onsite at Schools. She is a certified Compost Facility Operator in the state of Maryland, and has trained with the internationally renowned Lubkes in Austria, who specialize in a unique technique that enhances the humus content and quality of compost. Brenda Platt is the director of ILSR’s Composting for Community Initiative. She has worked more than three decades fighting trash burners and promoting waste reduction, recycling, and composting. She has authored numerous reports on composting including: The State of Composting in the U.S.: What, Why, Where, and How, Growing Local Fertility: A Guide to Community Composting, BioCycle’s Residential Food Waste Collection Access Study, and Yes! 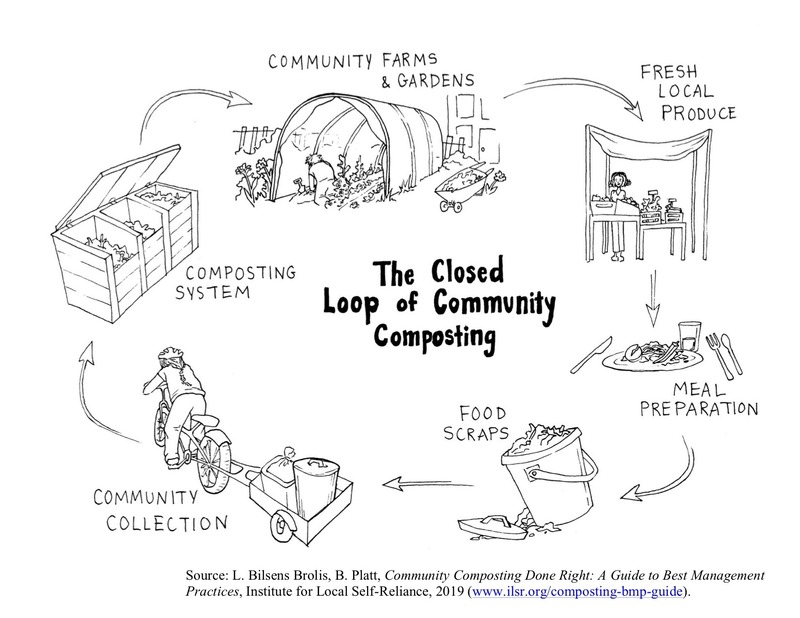 In My Backyard: A Home Composting Guide for Local Government. In 2017, the U.S. Composting Council awarded Platt its H. Clark Gregory Award for outstanding service to the composting industry through grassroots efforts. She has been certified twice in Maryland to operate commercial scale facilities. The Institute for Local Self-Reliance (ILSR) is a national public interest organization founded in 1974 to support environmentally sound and equitable community development. ILSR provides research and technical assistance on recycling, composting, zero waste planning and implementation, decentralized clean energy, community broadband, independent businesses, and other facets of a homegrown economy.